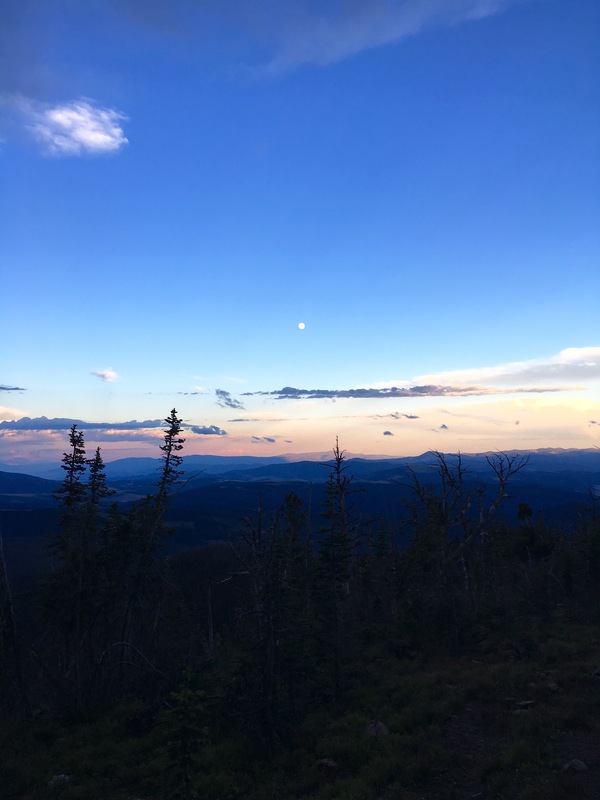 This entry was posted in Continental Divide Trail, wrong way gang and tagged backpacking, bigsky, hiking, montana, mt, sunset, thruhike on July 27, 2016 by GROUCHO. 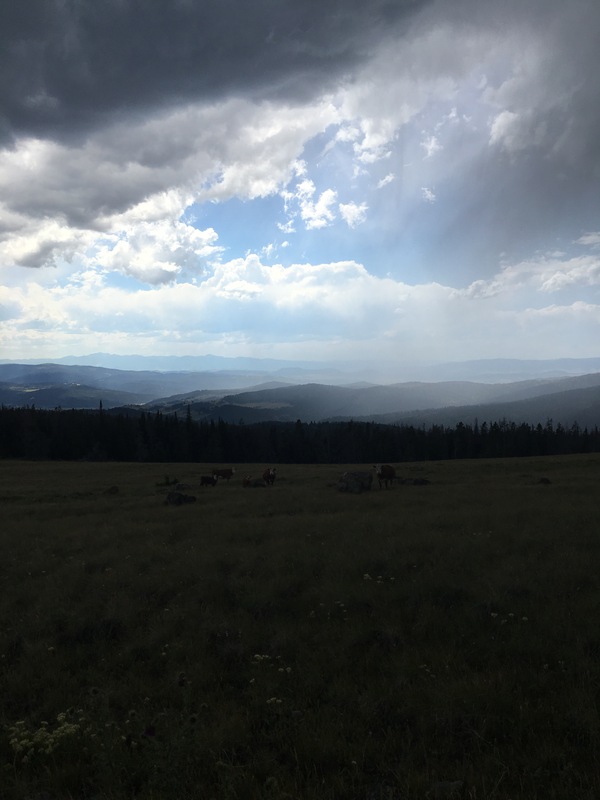 Despite the negative feedback we’ve received concerning our route choice – deviating from the ‘actual’ divide trail for another alternate – we’ve also got some real positive messages (thanks!). The reality is sinking in – we’re off trail and relying only on our own abilities to create and survive this new route. No red line, no water or resupply or milage data, no northbounders to ask about tips. 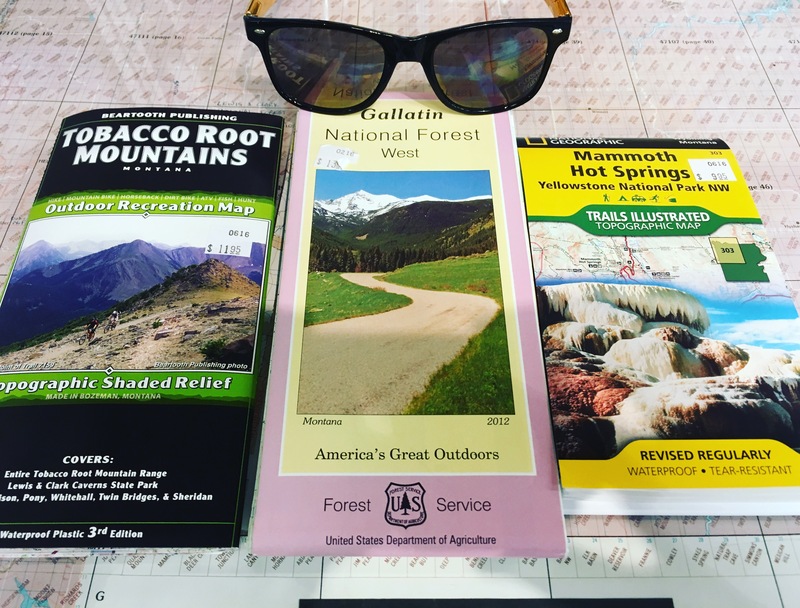 Only topo maps and a couple of anecdotal examples guide us. It’s awesome. It feels good to push beyond these boundaries. Not that we’re building deadfalls for chipmunks & tanning their hides with their own brains to make loincloths. But we’re increasing our map literacy, overcoming fears of asking for help, and trusting our intuition. I’m a different person than I was when I began walking long trails, and this world is a long, long way from the city I’ve called home for the past 15 years, and even further from the suburbs I grew up in. It’s a world Harpo and I create and navigate together thru shared vision, integrity, honesty and sometimes a few tears. It’s not easy, but it’s certainly not boring either. 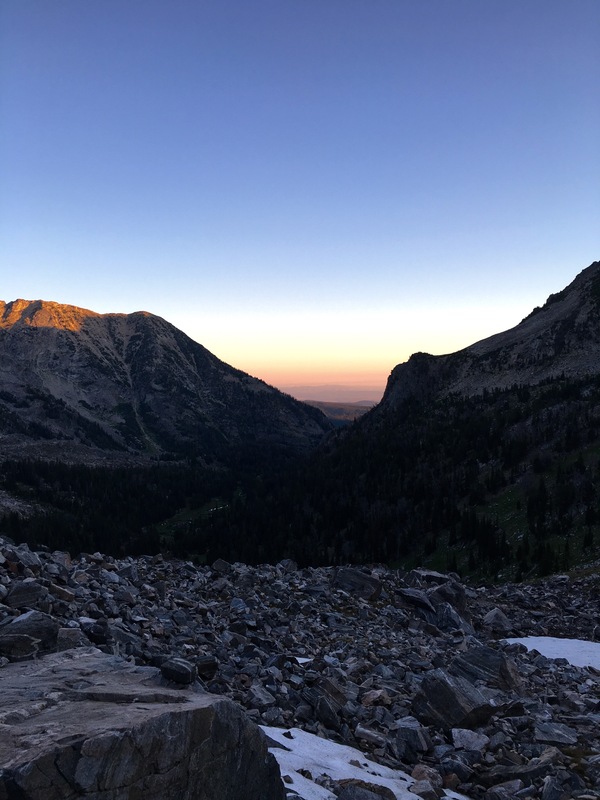 This entry was posted in Continental Divide Trail, wrong way gang and tagged backpacking, Big Sky, cdt, hiking, maps, thruhike, wrongwaygang on July 26, 2016 by GROUCHO. We weren’t planning on taking a full day off so soon but I Feel ok about it because “half mile”, the famous PCT data collector, is in the hotel and HE’S Taking a double zero. We focus on our Big Sky routing today. First at the Fire Tower Coffee shop where we upload online maps. Gaia is an awesome $20 phone app. it comes with a global topo map with common paved roads, dirt roads and trails. The map is viewable online and you can download any sections you want for offline use. There’s another app called PDF MAPS which is free, but you have to search their database for maps you want and sometimes pay for them if they are proprietary (i.e. National geographic Etc). Like Guthook, the apps can use the gps in our phone to show us within a few meters where we are on these maps. We decide to use Gaia for help on our side trip. 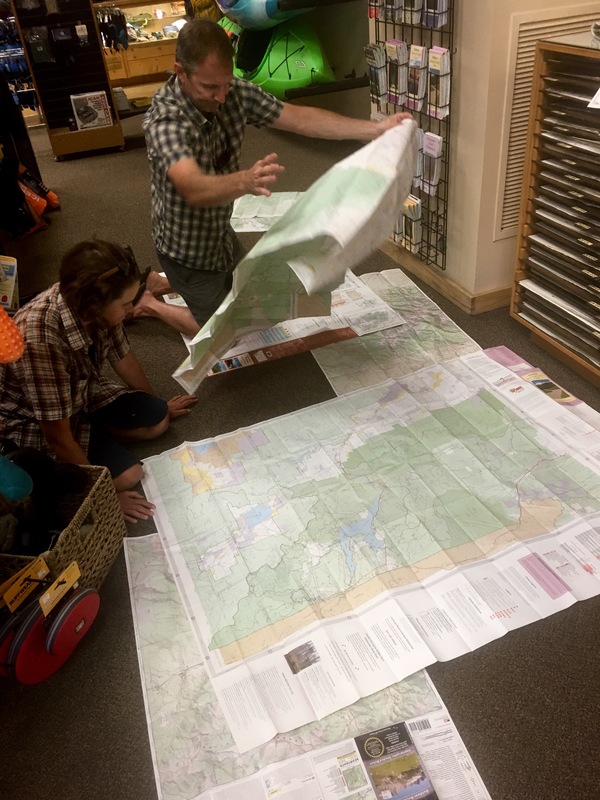 At the Base Camp Outfitter with Tim’s help we spread maps everywhere and choose the three pictured above. Then we eat amazing pizza at Bridge Pizza. Finally at the Library we print more detailed maps that other hikers (the Onion and Brian) have published of their routes thru this area. Prints are 10 cents at the library and an hour of Internet is free. We head to Real Food which lives up to its promise with fruit, vegan snacks and a killer bulk section including powdered hummus (which I will literally start adding to every meal until I run out). Back at the hotel, we lay out our maps comparing routes, choose a trajectory that works best for us (highlighting it in pink) and trimming off the unnecessary sections. As we are booze free (for now! ), we enjoy a nightcap of sparkling water and coconut milk Ice cream. Ron, who we met on trail a few days ago, arrives in Helena and offers us a ride to the trail head before he heads home to Portland. He’s paying back all all the hitches he’s got over the years. What a swell fellow. We hope to see him in Portland! At the trailhead we eat some fresh food we packed out then hit the trail. it’s impeccably well maintained and we easily hike 15 miles before dark. However a longish section up a forest road sports “private property” signs on every turn. We look/walk for an hour, and finally find a flat patch at the crest of a hill. Obviously not within a private property boundary but maybe next to their driveway?! Not our finest moment but dusk is upon us and we must needs sleep. Today is tough. The trail, still impeccably maintained, continues but is slightly dull. Mostly tree tunnel and a lot of half dead forest due to pine beetle. My mood mimics the melancholy of the forest. Now that we’ve chosen to do the alternate I feel anxious to get there. Get somewhere. GET ANYWHERE. The afternoon sun blazes thru our dusty path. We meet hikers who tell of a lake but the marshy reality thwarts our dreams of a cool swim. 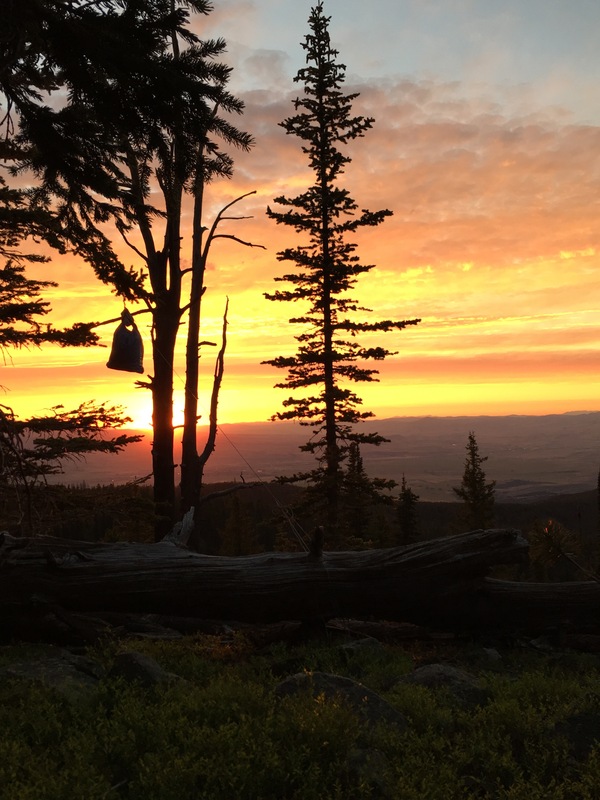 Again, it takes us a half hour to find a campsite but when we do – we find a little cozy “hole” (as Huck calls them) nestled between trees with a breathtaking Montana sunset. I’m bummed. Groucho is bummed. We’re all bummed. It’s another blazing, meh day with an 18 mile waterless stretch. 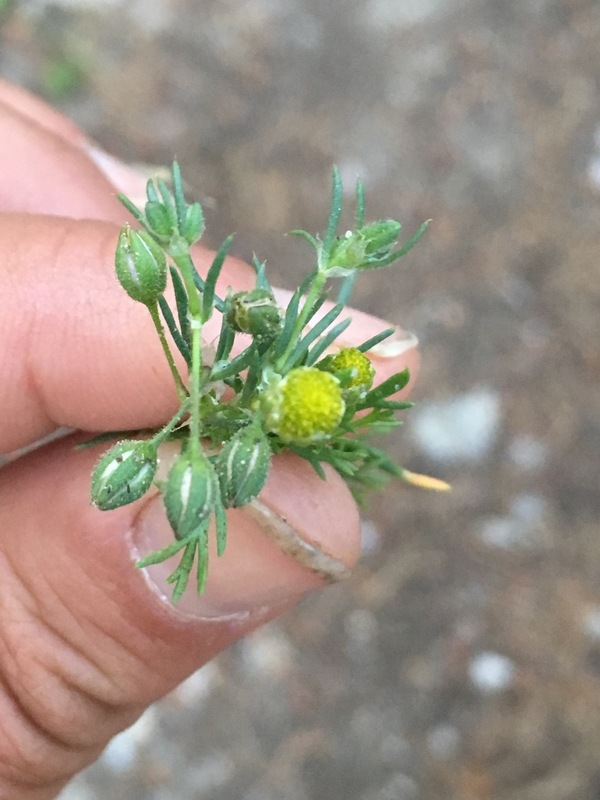 Finding camomile in a dusty patch of trail brings a sweet relief to my nerves and hiker stench. I stash a sprig in my shirt pocket to dry out. Around 6 we track down a campground on the map – they offer well water and PICNIC TABLES. we sit. Then I really want to stay. Groucho pushes me onward. Not harder than I want to be pushed -today- but I do often feel he wants to always go just a little further… a little faster… Than I. We find a high forestry knoll to bed down beside a country road. We can hear the occasional boozy drivers and a random gunshot (it’s Friday night in Montana!) but they can’t see us up on the hill. We start with a 7 mile road walk. A bummer because pavement can bruise/wear out the feet. But miles can go faster as well. Then up up up 3.5 miles to our junction. THE JUNCTION. 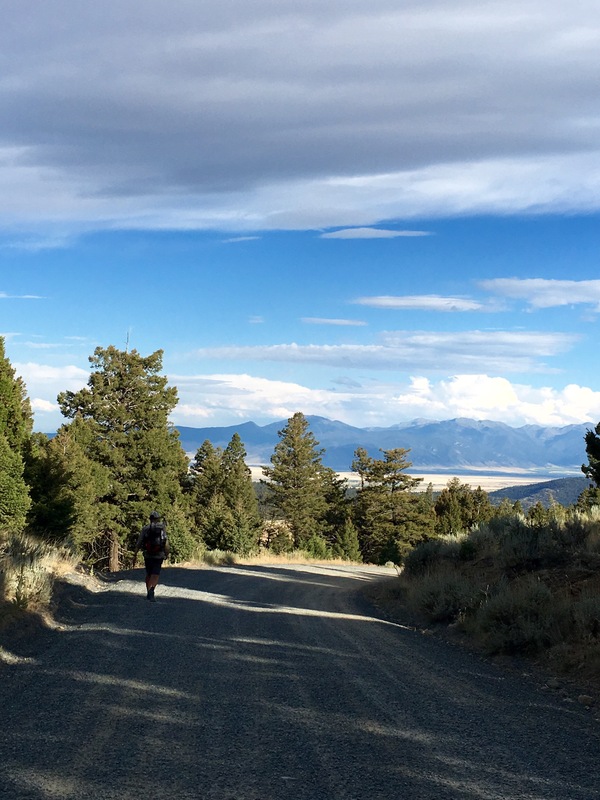 our split from the CDT and on to the Harpo and Groucho edition of the Big Sky Route. Okay so if I’m honest I’ll say I am amped up. I’m worried. Worried the trail junction doesn’t show up on Guthook data -so maybe we’ll miss it. Worried the mile calculations will be off and we won’t have enough food to get to Whitehall. Worried the trail will all be Blowdowns and bush whacking. Worried there won’t be water. With all these worries, it’s obvious I’m not worried about any of these things but rather, I’m just anxious because we’re attempting something new. And I’m assigning that anxiety to anything I can get my hands on. Then Groucho SHOUTS back (so I can hear him presumably) the answer to my question, explaining he answered before but I didn’t hear. And I stop to pee and Groucho leaves my sight. And then I come upon a junction. No Groucho. Ugh! Not this again. I think this might be THE junction because it’s at the right mileage marker but it’s not matching the map topography. Ugh. So I make my best choice and fly up the hill. Tears in my eyes, intermittently furious and also thinking maybe I just need a snack. You see, besides the stress of new routes and maps and tools, we are also burning 3000-4000 calories a day but I stupidly only packed 1800 Cal/day for this leg. 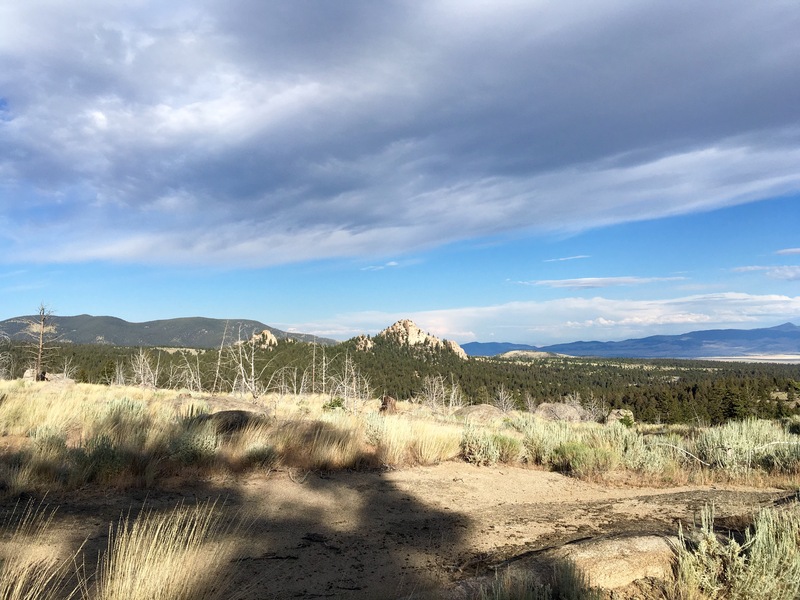 Hiker hunger kicks in around day 20 and today – on day 21 – my baby fat reserves are almost gone. This panic might just be legitimate hunger. Ok so it turns out there is an error in the data set and the REAL junction is another 1.5 miles up the hill. When I arrive Groucho seems happy enough. But I have FEELINGS. I try to repress them and focus on food but then some bad communication happens and for 30 minutes we stop to discuss impressions, assumptions, blame, communication, hunger, fear, routes, empathy, protocols and defensiveness. We both feel like real adult champions, tho completely emotionally depleted. 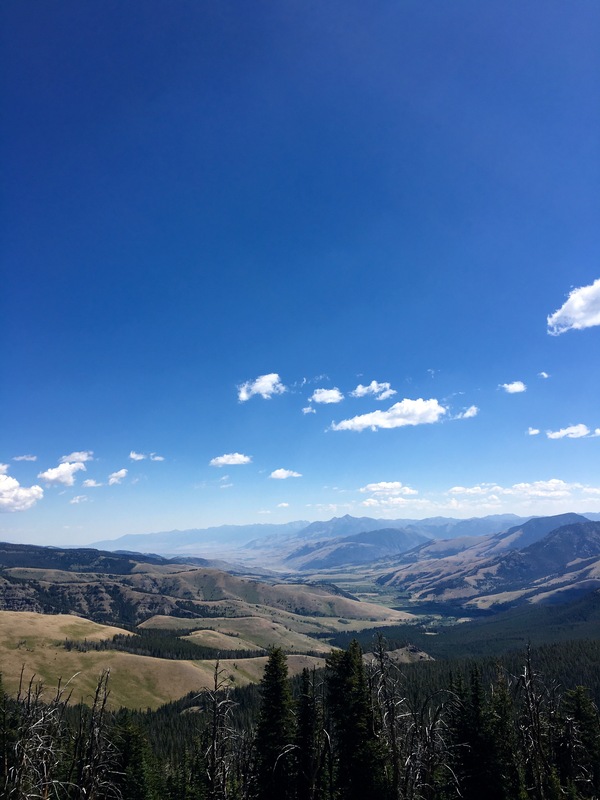 we finally set off the beaten CDT path and onto the Nez Perce route. I needn’t have worried. this trail is easy and wide and follows a creek. After 5 miles we intersect with a dusty road populated both with ATVS and REAL COWBOYS!!! We reach delmoe lake by 5pm and wash, do laundry, eat dinner and rest for a half hour. Then we hike onward, away from the lake. As evening approaches more and more ATVS drive by us, blowing dust in my face and hot air up my recently cleaned skirt. Here, the desert-like terrain reminds me of So Cal. Cactus and prickly seed pod plants and scrubby pines and sage brush galore. 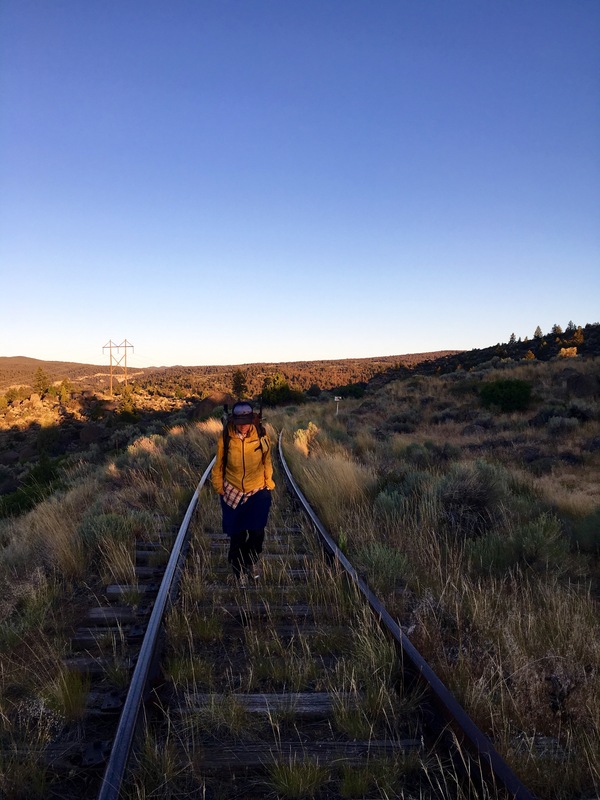 Finally, frustrated with the dust kicked up by by weekend warriors, we walk along some adjacent abandoned railroad tracks. The boards are rotting and sage brush is thigh high in places but the romance of it thrills me. We approach a humble railroad trestle over a stream. No problem. We got this. The 12 year olds in Stand By Me handled it and so can I. Though the boards are strong and true, they groan with my first few steps. A few minutes later I begin to notice how train ties are not always evenly spaced and also not spaced for a easy human stride. I adjust. My steps grow short and precise. No problem. But then in the spaces between the wooden ties I spy glimmers of the river below. VERY FAR BELOW . My heart starts to race. My body, I’ve found, is immensely intelligent. Give it a crazy challenge and it figures out what to do, where to step, how to balance, but that tricky MIND is so dumb and gets in the way. Half way across the trestle my mind becomes convinced I will step into one of the gaps between the boards. This is inprobable but even if I DID I would trip but almost certainly not fall thru the cracks to the gully below. I know this, my feelings know this. But my MIND is so dumb. Groucho passes me on the right. I am afraid to lookup and see how many boards are left so I tell him to tell me I’m close. He says Very Close. I repeat: very close. I discover if I look 3 boards ahead I feel safer than looking at the board just below because the vertigo or whatever I’m experiencing is heightened by the light and movement of the water below. I focus three boards ahead and each step say aloud “Very Close.” Very Close. Tears shine in my eye sockets and I hold my hands aloft like a toddler. I am in a middle of a crisis. I know if i stop to look around it will get worse so I just repeat “very close. Very close. very close.” Finally. finally. I make it. 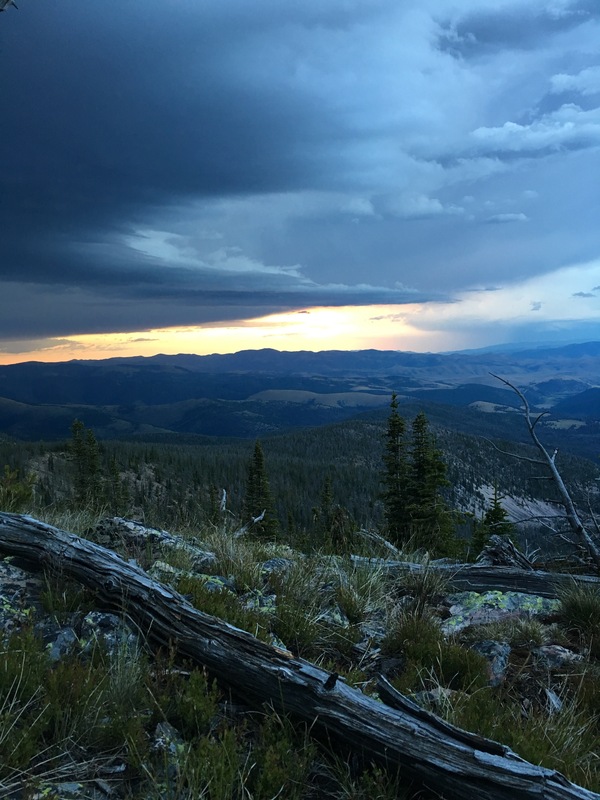 This entry was posted in Harpo's CDT Journal, wrong way gang and tagged America, cdt, CDT16, CDT2016, continentaldividetrail, montana, sobo, thruhikers on July 24, 2016 by Harpo. Finally strawberry season! Now that the food’s here, where are the bears at? 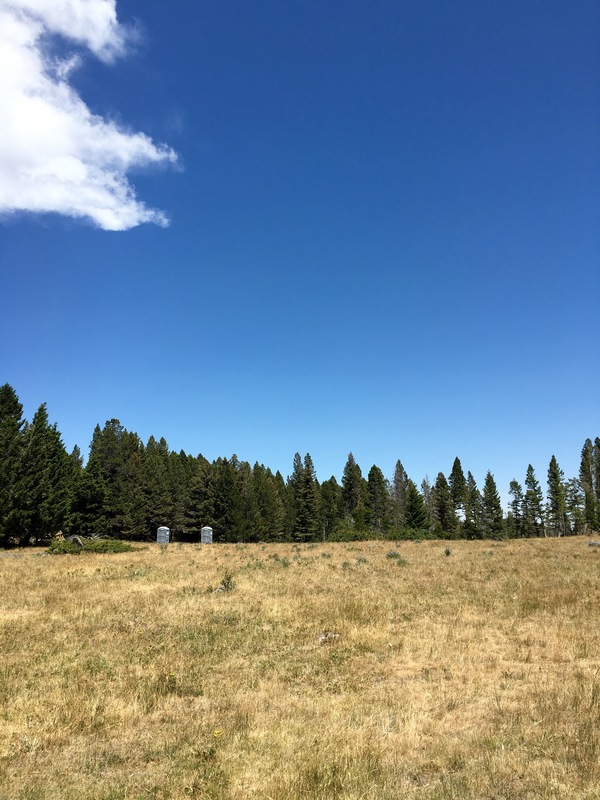 This entry was posted in Continental Divide Trail, wrong way gang and tagged backpacking, Big Sky route, cdt, continentaldivide, hiking, thruhike, wrongwaygang on July 24, 2016 by GROUCHO. Harpo and I were looking for a challenge. 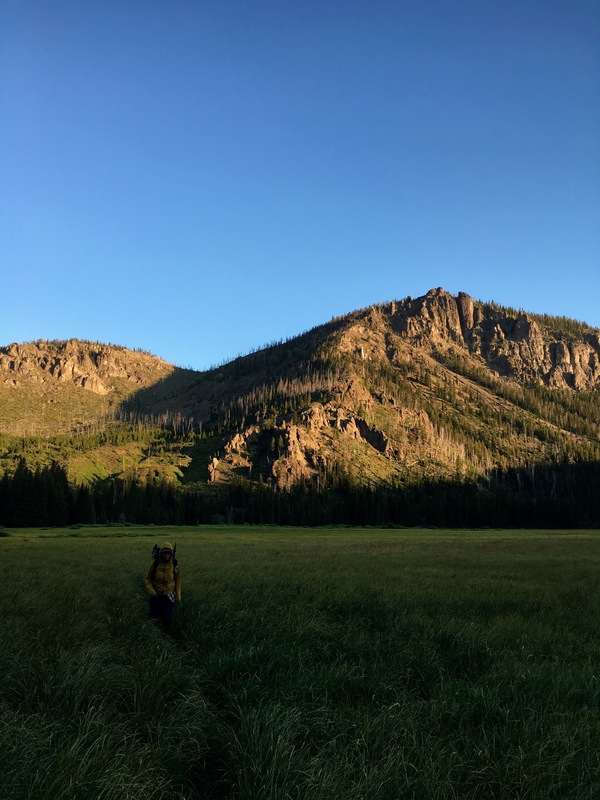 Tho we have been enjoying the daily route finding and navigational challenges of the CDT, there was still somewhere we hadn’t gone – choosing our own route south, off the beaten path. 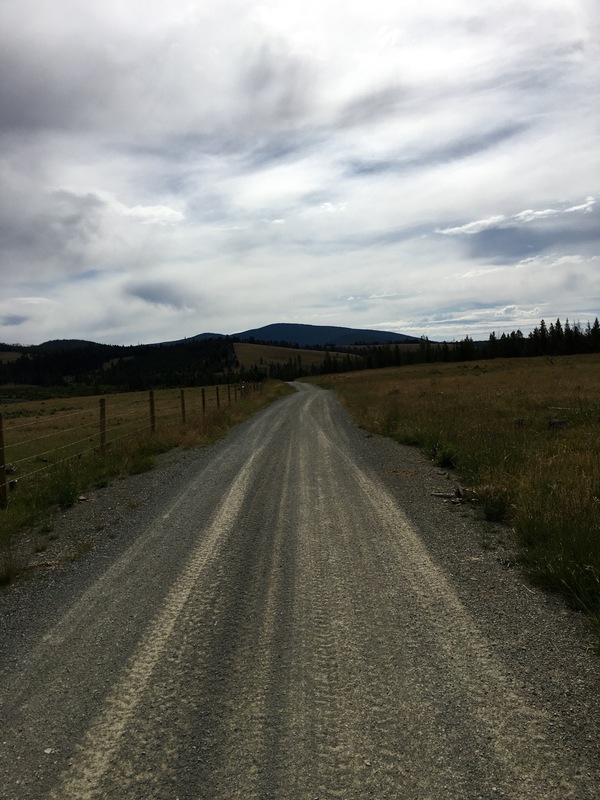 So we decided, after several days of conversation, to try the Big Sky route. 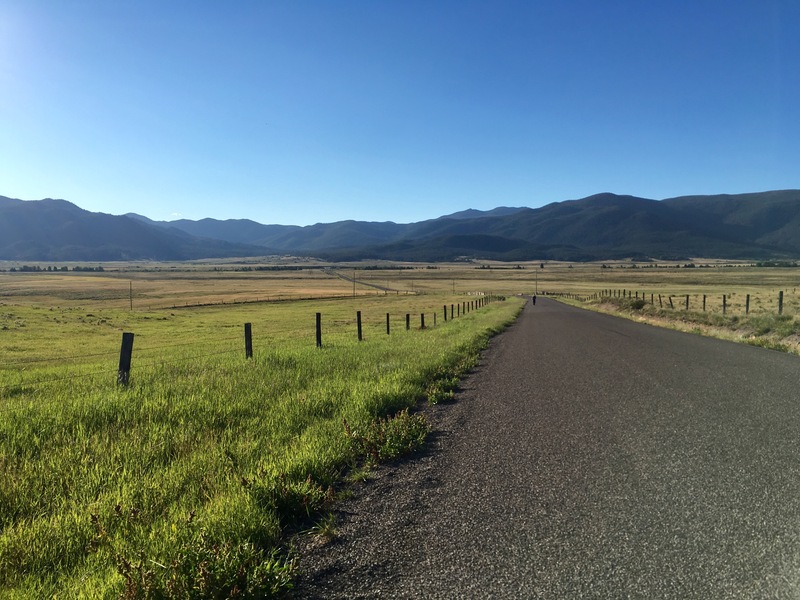 Diverging from the CDT just after Butte, MT the route will take us south thru the Tobacco Roots and Spanish Peak mountains, the Gallatin National Forest and Metcalf Wilderness. 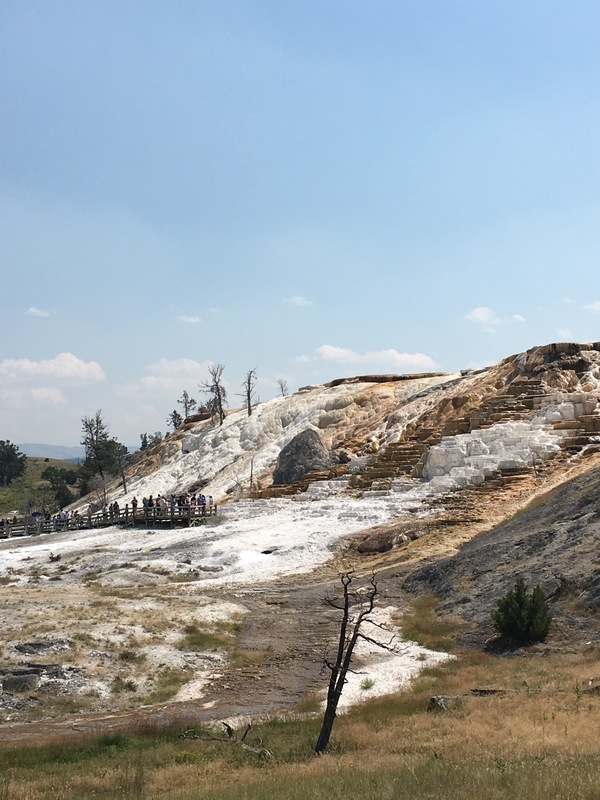 We’ll end up traversing the northern rim of Yellowstone and making a long loop around the eastern side of the park, rejoining the CDT at the southern entrance. We’re not the first, and I’m sure not the last to attempt this reroute. The Onion originally mapped it during his yo-yo in 2007 and others have documented variations. Tim at the Base Camp outfitter in Helena, MT was integral in helping us get the right maps and understanding the country. So using two anecdotal tales and three maps, we’ll head south into the less known! 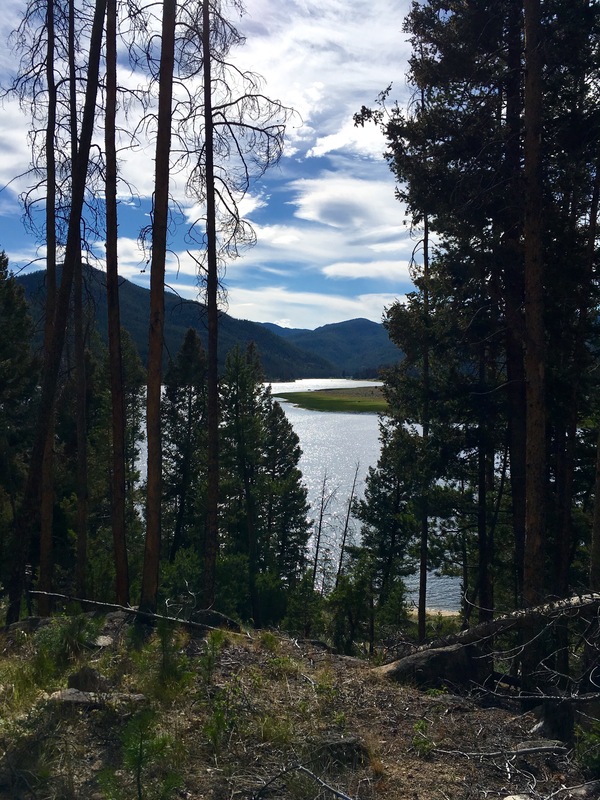 This entry was posted in Continental Divide Trail, wrong way gang and tagged backpacking, cdt, hiking, thruhike, wrongwaygang on July 22, 2016 by GROUCHO.